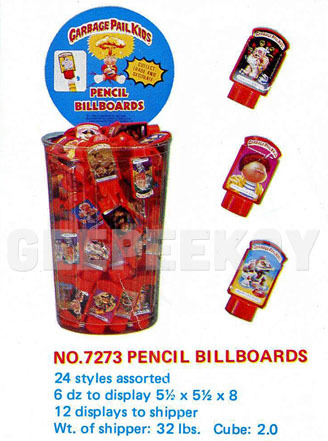 Below is a scan of the Pencil Billboards section from the 1986 Imperial Toy Catalog which includes detailed product information and item descriptions. 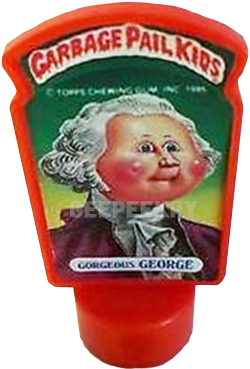 It is interesting to note that the product catalog image does NOT INCLUDE the Garbage Pail Kids banner on the billboards!? 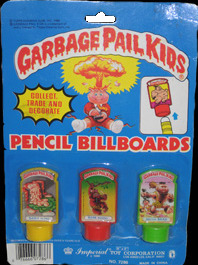 Pencil Billboards were created by Imperial Toys in 1986 as part of their large Garbage Pail Kids-related toy line. 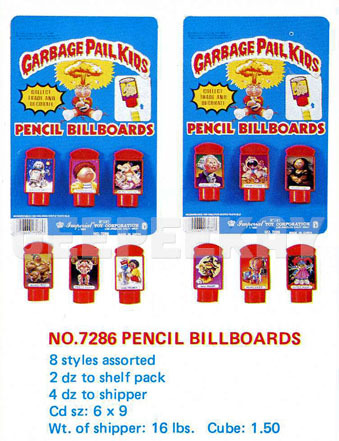 There are 24 different characters on the Billboards. 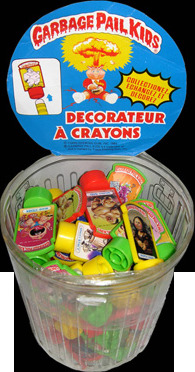 Couple the number of characters with the 3 different colors of plastic, and a 'complete set' would be nearly impossible to assemble. 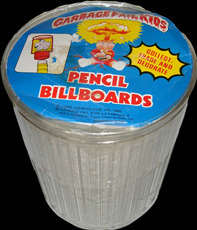 The trashcan is rather simple in design, made of clear plastic with a cardboard insert/lid. 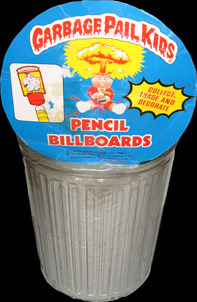 When closed, the lid reads 'Pencil Billboards' and contains information about how to collect and use the product. When open, the same information is displayed, however this time in French. 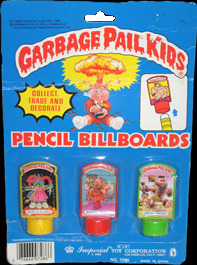 Also, the cardboard has artwork on it that makes it look like the inside of a trashcan. 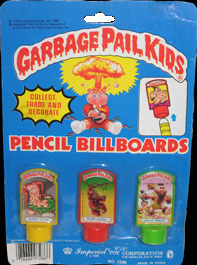 The billboards themselves are just thrown in randomly into the can. 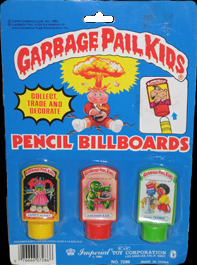 These Pencil Billboards Trash Cans are EXTREMELY rare and never show up for sale.